Canelo Alvarez Q & A discussing Rocky Fielding fight, Floyd Mayweather rematch and more! LOS ANGELES (Nov. 27, 2018): ERIC GOMEZ: I want to thank everyone for participating in the official Canelo International conference call ahead of the big fight December 15 between Canelo Álvarez, WBC, WBA, Linear and Ring MagazineMiddleweight World Champion, moving up in weight, to challenge Rocky Fielding, who is the WBA Super Middleweight Champion. This event will take place at Madison Square Garden and will be streamed live on DAZN. We’re less than 20 days away from witnessing Canelo trying to make history and become a three-division world champion. He wants to join the legendary fighters out of México: Julio Cesar Chávez, Erik Morales, Mark Antonio Barrera, and Jorge Arce in becoming a three-time world champion, if Canelo beats Rocky Fielding. This will also be Canelo’s first fight at Madison Square Garden, which he is very, very excited about. He’s going to be walking in the footsteps of many great fighters including Muhammed Ali, Mike Tyson, Sugar Ray Leonard, many others, Oscar De La Hoya obviously. Golden Boy prides itself as the leader in boxing, and we’re very pleased to be streaming this fight on DAZN, and for the fans that don’t know, you can subscribe and get the fight for free. Yes, that’s correct, you can get it for free. You’ll be able to see Canelo not only on DAZN, but at close-circuit theatres everywhere throughout the country. And if you can’t see it on TV and if you want to be there in person at the Garden, there are still some tickets available. You can go to the Madison Square Garden box office or Ticketmaster. The phone number for Ticketmaster is 866-858-0008, or you can go online,tickestmaster.com, GoldenBoytickets.com or www.msg.com. Just a quick note to all of you. We’re also going to be doing international call with Rocky Fielding next Monday, December 3 at the same time, 11:00 A.M. Pacific, 2:00 Eastern, so make sure you guys get on the call for that. CHEPO REYNOSO: We’ve been having great preparation, all is going as planned for this great fight. Canelo is going to make history that night and be one on the shortlist of Mexicans to be a three-division world champion. That’s why the work has been intense. It’s been serious and done with a lot of responsibility and confidence, and salutations to all: On the 15th of December, we will crown Canelo Álvarez as a three-division champion. Now, the next person I would like to introduce is by far the leading contender for trainer of the year — he’s got my vote — he’s guided Canelo to all his recent victories. This man has also just started training our prospect of the year, Ryan Garcia, and is doing a great job with him. I want him to say a few words, Mr. Eddy Reynoso. ERIC GOMEZ: Finally, the man of the hour, he’s the middleweight world champion, WBC, WBA, Ring Magazine, and Linear champion, coming up, probably the most important victory of his career back in September, fighting again here for the first time at the garden in New York, I want to introduce you to Canelo Álvarez. CANELO ÁLVAREZ: I’m happy it’s a short time until fight night when I make history, and I’m really motivated for this fight. CANELO ÁLVAREZ: It’s very important to be in that list of about ten Mexicans to become three-division world champions, so very important to enter history. That’s why I’m here taking on this important fight, and it’s important that we win this title. CANELO ÁLVAREZ: No fight is easy. It’s not a secret that I’m a better fighter and that I’m more experienced, but I’m taking a risk by entering into a comfort zone of a champion and his weight, that’s a risk, and that risk makes it even. It makes it interesting. No fight is easy, so I’m preparing for a hard fight. I know that rocky is used to receiving punches from another weight class and I know that he’s taller. It’s not an easy fight, and I’m preparing for the best Rocky Fielding and to make sure that there are no surprises. Q. Last month you said that you would be willing to fight Floyd Mayweather again if he was interested in the fight. I’m curious what is the lowest weight that you could get down to a fight with Mayweather would be that you would still have the ability to turn in a decent performance, and how that flight would play out differently this time? Q. What do you feel you’ve learned in the time you fought Floyd the first time to make it more competitive and a fight that you can win? And this goes for Eddy, as well. CANELO ÁLVAREZ: He’s a good kid. He likes to learn. He likes to train. He has discipline, and that is what we like, and he’s a talented fighter so it’s nice having him in the gym. I know that Eddy will do a great job with him and I believe that he will teach him a lot so that he can achieve all that he wants to achieve in his career. CANELO ÁLVAREZ: Right now the goal, the objective, is to fight for this world title and win on December 15 and then go back to 160 points where I do best. If we’ll be moving up and down those divisions, we didn’t know, but right now our goal is to get the title to middleweight. CANELO ÁLVAREZ: You know, it doesn’t worry me, the height difference. We are working toward that. We will be working to get into it to guard, so it doesn’t worry to me at all. I’m a fighter who can adapt, and that’s what I’ll be doing when I fight him. Q. The fight with Golovkin was not that long ago. A lot of fighters, especially after the magnitude of that event, a lot of fighters would take a lot of time off. What was the reason to jump right back in the ring? Not that we’re upset to see you fighting so quickly, but did you think about taking more time out? It seemed a little more rushed than typical Canelo Álvarez. CANELO ÁLVAREZ: It’s because I had rest for one year. I like to be fighting. I like to be active, at least having two fights a year, and that’s why we wanted to do this so fast. I love boxing. If I could fight every month, I would love that. I love what I do and that’s what has maintained me where I am right now. CHEPO REYNOSO: They haven’t given us that information. We will have to visit that after the fight and they will give us more information. But the comments are good and they are very happy. It’s important for them to join the market here in U.S., and who else better than Canelo, who is not only the biggest star in boxing, but one of the biggest stars in all of sport. So, they are very happy right now, and I will be happy to give you more details after this fight. EDDY REYNOSO: We’ll be moving up in weight, and when a boxer does that, he’s basically experimenting. We know that we have a great fighter in front of us and that Canelo will be preparing well, so height won’t be a problem to us. He’ll adapt to those type of fighters and he has worked with those type of boxers throughout his career. I have no doubt that he’ll be successful in this fight. Q. There’s a lot of talk about GGG going over to DAZN now. Are you hoping he does so you can fight him again? And regarding the fights we’ll see in the future, like I said, I’m all willing to make a third fight, if we made two, I’ll make a third one. CANELO ALVAREZ: Winning by a KO is always impressive, and I am preparing to make the best of it in this fight by any way, by any means necessary. I’m going to give everything in the ring, and I’m always going to look for the KO as I do in my fights; and if I do, that’s good, and if not, I’ll just make sure I give a good fight to the fans at Madison Square Garden. CANELO ÁLVAREZ: When it’s done, I’ll come back to 160 pounds. Q. You’ve had some impressive victories in your career, where would this accomplishment with fielding fit in the top five? CANELO ÁLVAREZ: I’ve had many fights, and I’ve fought many great fighters, Trout, Cotto, Mosley, GGG, Mayweather, many fights that I’ve had. Each fight is important because it teaches you something, and I take this fight as important as the previous fights. So I’m doing the same thing in training, making it just as important and in each fight, there’s a risk. So I’m training hard to minimize that risk, but every fight is important, and I’m taking this fight as important as the others. Q. You’ve twice mentioned going back to 160. How important is it, with all the talent that’s there, for you to go down and to clean out and unify against someone in that division? CANELO ALVAREZ: It’s very important to have great fights at any weight. To return at 160 where I feel best, that’s what I have in mind, to go back to 160 and do what I always do, which is look for the best fights. Q. Eric, so back when he was coming up, there were some statistics of how good he was, but then when he knocked out Baldomir, that sensational knockout, it woke up a lot of people. From that point on, how difficult was it for you to hold him back because I know he wanted the Trout fight earlier than maybe you guys wanted it, and I know he wanted a lot of fights. Can you talk about his desire and the goals and where he’s at now? ERIC GOMEZ: You know, Canelo is a special fighter. He’s a special athlete. He was always very, very — even at 18 years old, I mean, he was always very mature for his age, and he’s tough, like any fighter. I mean, they want to fight the best, and we always had to hold him back. When we did — and you remember this, because you were around — when we did the fight with Austin Trout, I was against it, but he was adamant that he wanted that fight. He was adamant that he wanted to fight and there was something that he knew, and he saw that we didn’t. Obviously, we went with the fight because he was adamant, and he really forced our hand. But he’s always had that confidence about him. The same goes with the Golovkin fight. If it was up to us, we would have waited at least one more year, but he wanted it and he forced it. All the big fights, even the Mayweather fight, we didn’t think it was the right time to do the may weather fight; he wanted to, but he’s always been very confident in his ability, and he’s just always had that about him. ERIC GOMEZ: Oh, definitely. Floyd doesn’t want any of Canelo now. Floyd took the fight at the right time. He was fighting a fighter that, you know, was very young, 21 at the time. He didn’t have the experience. Floyd beat him with experience, that’s all he did, but now, it would be a different story. Floyd, he doesn’t want to face Canelo. CANELO ÁLVAREZ: I’m the wrong person to answer that. I haven’t finished with my career yet, and I’m not sure where I’ll be positioned in that list, so I would not like to answer that question. CANELO ÁLVAREZ: It’s very important to win this title. It would put me in the top 10 List of Mexican world champions, so it’s very important to win this title. Q. A couple questions for Chepo. You’ve been with Canelo from the beginning. Where do you view him right now along all the all-time great Mexicans? CHEPO REYNOSO: I think it’s not the moment yet. He’s still making history. When he finishes, history will put him where he corresponds. So right now he’s doing his job and when he’s done, the people making those lists can put him where he corresponds, so it’s important to keep winning. It’s too premature to make that call now, but in the future, people in charge of that will put him where he corresponds. CHEPO REYNOSO: Like I say, I can’t talk right now. I can’t answer that right now. But if we are talking about right now, he would obviously be one of the best fighters in history. He’s had great moments and great wins and until this moment he has won titles in two divisions, and he beat the previously seated best top fighter. So, if we are talking about now, he will be considered one of the best fighters in Mexican history. Q. And one more for you, Chepo. You’ve experienced 154, 160 and 168. What have you done differently from 160 to 168 for Canelo? CHEPO REYNOSO: It’s all different, 154 pounds, 160 pounds, 168 pounds, what he puts on his body is going to be different when it comes to what he’s eating, carbohydrates. Also, the strength training is different in each division, but thank God, things have been going well for us. CANELO ÁLVAREZ: You know, the DAZN logo I would see it, but to be sincere, I had no idea what it was, how it was managed until the offer came to me. But to be sincere, I didn’t know what it was before. Q. So now that you’re obviously the face of DAZN, have you subscribed to it? Have you checked it out? Have you seen how the stream looks? Are you talking about it with your friends and your fans? CANELO ÁLVAREZ: Yeah, I downloaded it. I have it on my phone. I’ve seen fights on it, I’ve connected it to my TV and I have it on my phone right now. It’s always updated with what is happening. Q. Do you think it’s going to take a lot — I know it’s not expensive. I have it and it works extremely well. How much do you think it’s going to take to get your fans, boxing fans, to break what they are used to and to make the transition? Once you have it, it’s extremely easy to use, but you have to get them to take that first step. How much of a spokesperson will you be to try to convince your legions of fans that this is a way to watch my fights? Q. It’s one thing to win all the fights that you’ve won, to win your title, to become a top superstar champion in boxing and then you sign the record contract with DAZN. Did you take more satisfaction in being a champion or knowing that you signed the richest deal in the history of sports? But to be the main event there at MSG, and if I’m not mistaken, first Mexican there in a long time, it fills me with pride. It all depends on Saul. He’s a young fighter and he’s very disciplined and as he said before, he likes to fight. He loves to fight. He always — he doesn’t move up too much in weight, but it depends on him. The dates in May and September are very important. They are very important, Chavez started it and it continued with Oscar De La Hoya and now it’s continuing with Saul, and it’s very important for Mexican and Mexican American people in the United States, but it depends on Saul. I know that he’s always wanted to fight in December, and if he can and he’s able to, no problem, we’ll do it. For me it’s always important to fight often. Like the routine and I like discipline that’s in boxing, and I like to fight often. I would like for fans to think that every time I fight, every time Canelo fights, it’s an important date, whatever the date. Q. The big Mexican fighters before you, it was almost a requirement to try to speak English, but usually in your interviews, you’ve communicated in Spanish. Do you think that has affected you with regards to how much money you make? ERIC GOMEZ: You know, something that Canelo is working on, sometimes he’s answering in English and he’s answering it more and more. But most importantly, he has a clean image and that’s what sponsors like. He’s the only fighter right now who directly has sponsors. Also his style of fighting, the way he is, the fact that he’s clean, all that is better than the language. It’s more important. And the message is strong: He’s disciplined, clean, educated and that’s more important than language. His style of fighting, too, he always gives great shows and great fights. CANELO ÁLVAREZ: It hasn’t affected me whether I speak English or not. I try to learn as much as I can. I can understand a lot, and I can maintain a conversation and it has not affected me. There are a lot of great ways to learn English quickly and easily, such as A. J. Hoge and his English course. What worries me is fighting and training, and I think people like that more than talking, because if you can speak English, but you can’t fight, or you don’t give good fights, you know, it’s the same thing. Q. You’ve had a lot of achievements this year. How would you describe the year 2018 for you? I’ve always known who I am, and I hold my head up high, and it was a year of winning. I learned a lot in my personal and professional life. I learned to be tenacious and train hard and having a strong mentality, it can take you from one extreme to the other, and I’m happy all that I’ve achieved. All that I’ve achieved and what I’ve done has made me the man and the athlete that I am today. CANELO ÁLVAREZ: He’s a strong fighter. He’s tall and he has a lot of reach, and he’s also used to receiving punches from fighters of a different weight class. I will have to see how I feel because it is a risk there, but we’re training real hard to ensure that there are no surprises. CANELO ÁLVAREZ: I don’t know who will win but it will be a competitive fight. Whoever gives more in the ring will win but also whoever fights more intelligently can win. Wilder throws good, powerful shots, and Tyson boxes more, he moves more, but we will see. I feel it’s a competitive fight. CANELO ÁLVAREZ: We don’t know. Both have different styles. Wilder is very tall. It will be competitive. If he can box with him and be very prepared, then maybe he can win this fight. Q. You’re ending 2018 against Rocky Fielding, you said with the win, you’re going to go back down to middleweight. Do you have an idea of what some of your plans for 2019 might be? 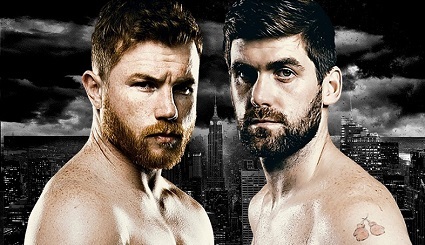 2 Responses to "Canelo Alvarez Q & A discussing Rocky Fielding fight, Floyd Mayweather rematch and more!" Hand picked guy for a fake belt. Canelo is a weak champion and he should have lost to GGG twice! No way Canelo will fight GGG in a third fight. He escaped with a win and won’t chance losing that.